House N was designed for two – a mother and daughter. The site is located in an area which has long been a residential district, and more than 80% of its boundaries are shared with its neighbours, meaning that it is difficult to secure privacy let alone any hope for a view. Narrow paths and alleyways less than two meters wide crisscross and surround the site; most of them dead-ends leading to each house in the area. They are used by the neighbours to reach the main street. The main objective for House N was to secure a quality living environment. While the exterior walls of the house were heightened to approximately six meters to control the view from the outside, the idea was to create a welcoming and friendly atmosphere in terms of the surrounding community. 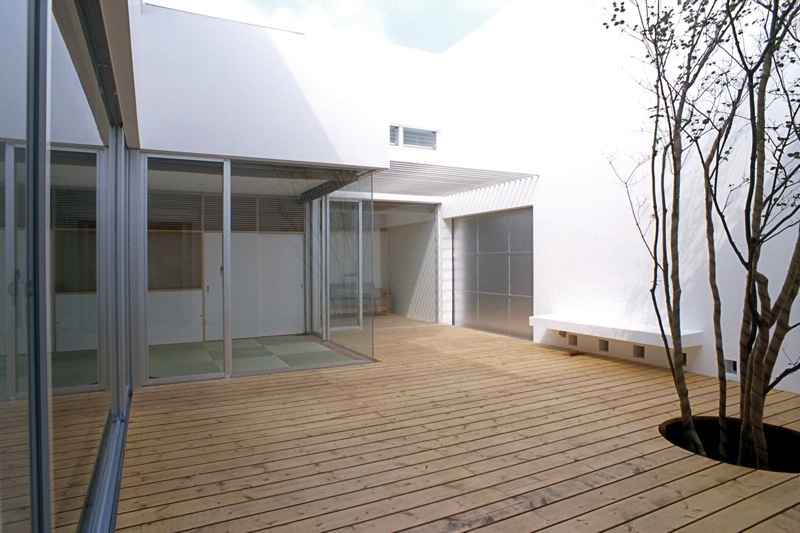 A patio residence is inclined to shutting itself off the outside world, so here, the design boldly draws a route to run around the exterior of the building and through the patio, as if to connect and become a part of the outer paths of the site, inviting the neighbours to walk through. All the windows are faced towards the patio to maximize the intake of light, and the rooms are bright and cheerful by keeping their depth within four meters. The large windows from floor to ceiling bring in the patio into the rooms and also seem to project the inner space towards the outside. The three-meter square cantilevered tea ceremony room is free of columns and placed so that it juts out onto the patio, bringing a sense of composure suited for mental discipline. The heart of the house, the patio, is covered with a wooden deck on the same level as the inner rooms, planted with a symbolic tree, and fitted with a bench, steel-pipe pergolas, and open tea ceremony room. All these devices contribute in making House N a success as a new converging point for the community.